Only registered and logged in customers can see product prices and can purchase. Add mandatory VAT number field in billing address, in order email and in order details in backend. Create customer groups with customized discount percentage to differentiate price lists. Feel free to decide which customers allow to buy from your store, enabling the accounts you deem appropriate. Send email notification to each customer when its account is enabled and active. Only allows customers to check out if their cart total is equal to or greater than established amount. Customer must add to cart no less than established quantity of product. Only allow the product to be purchased in groups of established quantity incremental. Customize all B2B messages by using proper filters. Assign multiple customers to a group in one single click or enable/disable customer accounts with bulk actions. Simplified login with email address instead of username. 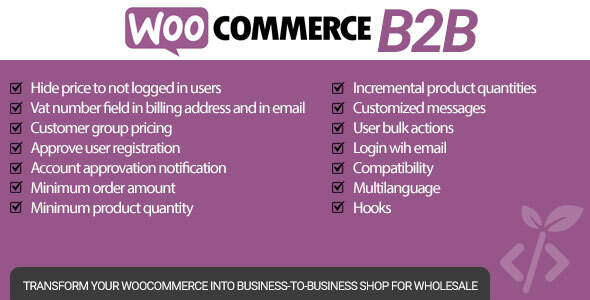 Require WooCommerce v3.x.x and compatible with all themes. 100% multilanguage support and currently provided with Italian and English. Lots of hooks to easily change the default behavior. Where do I see the options?